Monthly Column for Project Syndicate, an association of nearly 500 media outlets. Articles for Vanity Fair, OpEds for The Hive. The Great Divide, a New York Times Opinionator series about inequality, moderated by Joseph E. Stiglitz, which ran from January 2013 to June 2014. For articles in The Economists Voice, click here. Beyond GDP, Project Syndicate, December 3, 2018. Disaster Capitalism Comes to Puerto Rico, with Martin Guzman, Project Syndicate, November 15, 2018. Can American Democracy Come Back?, Project Syndicate, November 6, 2018. A Rigged Economy and What We Can Do About It, Scientific American, November 2018. People vs. Money in America's Midterm Elections, Project Syndicate, October 11, 2018. Beyond Secular Stagnation, Project Syndicate, September 5, 2018. The Myth of Secular Stagnation, Project Syndicate, August 28, 2018. Meet the 'Change Agents' Who are Enabling Inequality, Review of Winners Take All: The Elite Charade of Changing the World, by Anand Giridharadas, New York Times, August 20, 2018. The US is at Risk of Losing a Trade War with China, Project Syndicate, July 30, 2018. Buzzwords and Tortuous Impact Studies Won't Fix a Broken Aid System, with Sabina Alkire (Oxford Poverty and Human Development Initiative), Florent Bédécarrats )French Development Agency), Angus Deaton (Princeton University, Nobel prize in economics), Gaël Giraud (chief economist, French Development Agency), Isabelle Guérin (French National Research Institute for Sustainable Development), Barbara Harriss-White (Oxford University), James Heckman (University of Chicago, Nobel prize in economics), Jason Hickel Goldsmiths (University of London), Naila Kabeer (London School of Economics and Political Science), Solène Morvant-Roux (University of Geneva), Judea Pearl (Columbia University), Cécile Renouard (Codev-Essec Business School), François Roubaud (French National Research Institute for Sustainable Development), Jean-Michel Servet (Graduate Institute), The Guardian, July 16, 2018. American Democracy on the Brink, Project Syndicate, June 29, 2018. How to Exit the Eurozone: Italy is Right to Consider Leaving the EU's Common Currency Area, Politico, June 26, 2018. Can the Euro Be Saved?, Project Syndicate, June 13, 2018. The Roots of Argentina's Surprise Crisis, Project Syndicate, June 5, 2018. How Costa Rica Gets It Right, Project Syndicate, May 8, 2018. Trump's Trade Confusion, Project Syndicate, April 5, 2018. When Shall We Overcome?, Project Syndicate, March 12, 2018. Post-Davos Depression, Project Syndicate, February 1, 2018. A Fiscal Plan for Puerto Rico Recovery, with Daron Acemoglu, Alan A. Aja, Robert Blecker, José Caraballo Cueto, Hector Cordero-Guzman, William "Sandy" Darity, Jr., Alberto Dávila, Zadia M. Feliciano, José M. Fernández, Richard Freeman, Jason Furman, Jamie Galbraith, Martin Guzman, Darrick Hamilton, Simon Johnson, Thea Lee, José Alameda Lozado, Mario Marazzi Santiago, Marie T. Mora, Francisco L. Rivera-Batiz, Dani Rodrik, Jeffrey Sachs, Gene Sperling, Mark Weisbrot, and Antonio Weiss, January 24, 2018. The US Donor Relief Act of 2017, Project Syndicate, January 2, 2018. The Global Economy's Risky Recovery, Project Syndicate, December 20, 2017. Don't Expect Debt Payments from Puerto Rico Any Time Soon, The Washington Post, with Martin Guzman and Antonio Weiss, December 11, 2017. The Globalization of Our Discontent, Project Syndicate, December 5, 2017. In Celebration of Africa's Fine, Upstanding Muckrakers, Sunday Times (South Africa), with Anya Schiffrin, November 12, 2017. Has Trump Captured the Fed?, Project Syndicate, November 3, 2017. 230 Law and Economics Professors Urge President Trump to Remove Investor-State Dispute Settlement (ISDS) from NAFTA and Other Pacts, October 25, 2017. America Has a Monopoly Problem—and It's Huge, The Nation, October 23, 2017. Bail-ins and Bailouts: Incentives, Connectivity, and Systemic Stability, VOX, October 18, 2017. Intellectual Property for the Twenty First Century Economy, with Dean Baker and Arjun Jayadev, Project Syndicate, October 17, 2017. When It Comes to The Economy, Britain Has a Choice: May's 80s Rerun or Corbyn's Bold Rethink, Prospect Magazine, October 9, 2017. Déjà Voodoo, Project Syndicate, October 4, 2017. PROMESA's Dangerous Premises, with Martin Guzman, Project Syndicate, September 18, 2017. Learning from Harvey, Project Syndicate, September 8, 2017. Why Tax Cuts for the Rich Solve Nothing, Project Syndicate, July 27, 2017. Trump and the Truth About Climate Change, Project Syndicate, July 2, 2017. Austerity Has Strangled Britain. Only Labour will Consign it to History, The Guardian, June 7, 2017. Trump's Rogue America, Project Syndicate, June 2, 2017. Can Europe Be Saved?, Amherst, Spring 2017. Lessons from the Anti-Globalists, Project Syndicate, May 1, 2017. Obituary: Sir Tony Atkinson, Royal Economic Society Newsletter, Issue No. 177, April 2017. Janet Yellen Piece for TIME 100, April 20, 2017. Illiberal Stagnation, Project Syndicate, April 2, 2017. From Bad to Worse for Puerto Rico, with Martin Guzman, Project Syndicate, February 27, 2017. Letter to the Editor on Puerto Rico, The New York Times, February 27, 2017. How to Survive the Trump Era, Project Syndicate, February 20, 2017. Trump's Most Chilling Economic Lie, Vanity Fair, February 17, 2017. Nobel Economist: One-Percenters, Pay Your Taxes, CNN.com and on Frankfurter Allgemeine Zeitung, January 16, 2017. Trumpian Uncertainty, Project Syndicate, January 9, 2017. A New Year's Development Resolution, with Kaushik Basu, Francois Bourguignon, and Justin Yifu Lin, Project Syndicate, December 30, 2016. Why 2017 Could See the Collapse of the Euro, Fortune, December 30, 2016. A Nobel Laureate Explains How Trump Could Nuke the Economy, Vanity Fair, December 27, 2016. Bad News for America's Workers, Project Syndicate, December 19, 2016. The Brutal Battle Over the Euro, New York Review of Books, December 8, 2016. How Democrats Can Fix Themselves: The Days of Triangulation Are Toast, Vanity Fair, November 17, 2016. What America's Economy Needs from Trump, Project Syndicate, November 13, 2016. Would a President Trump Be Good for Business?, Tampa Bay Times, November 1, 2016. Why the Economy Has Failed So Many - And Why Donald Trump Has the Wrong Answers, Cleveland Plain Dealer, October 26, 2016. The One Thing Our Next President Needs to Know About the Economy, Vanity Fair, October 24, 2016. How Trump Happened, Project Syndicate, October 14, 2016. The Real Scandal Behind the Panama Papers, Vanity Fair, September 29, 2016. The Apple Tax Tussle Shows the Need for a New Way of Taxing Profits, with Erika Siu, in Süddeutsche Zeitung, September 19, 2016. A Better Economic Plan for Japan, Project Syndicate, September 14, 2016. Reform or Divorce in Europe, Project Syndicate, August 22, 2016. A Split-euro is the Solution for Europe's Single Currency, Financial Times, August 16, 2016. The Problem with Europe is the Euro, The Guardian, August 10, 2016. Why We Left the Panama Commission, with Mark Pieth, TIME, August 10, 2016. A Nobel-Winning Economist Has a Plan to Save Europe, Vanity Fair, August 8, 2016. Globalization and its New Discontents, Project Syndicate, August 5, 2016. Trump and the Damage Done, Boston Globe, August 4, 2016. From Brexit to the Future, Project Syndicate, July 6, 2016. Learning from Namibia, with Anya Schiffrin, Project Syndicate, June 14, 2016. Donald Trump's Biggest Vulnerability, Vanity Fair, June 1, 2016. Monopoly's New Era, Project Syndicate, May 13, 2016. TTIP and Climate Change: A Tale of Two Cities from Paris to Hannover and Mit TTIP zerstören Merkel und Obama ihr eigenes Werk ("Merkel and Obama destroy their own work with TTIP"), Suddeutsche Zeitung, April 21, 2016. What's Wrong With Negative Interest Rates?, Project Syndicate, April 13, 2016. How Hedge Funds Held Argentina for Ransom, New York Times, April 1, 2016. Justice for All? How Inequality is Eroding the Rule of Law, Verdict, Vol. 22. No. 2, April 2016. Tricks of the Trade Deal: Six Big Problems with the Trans-Pacific Partnership, Roosevelt Institute, March 28, 2016. The New Generation Gap, Project Syndicate, March 16, 2016. Article in Economic Report of the President, Chapter 7: The 70th Anniversary of the Council of Economic Advisors, February 2016. Closing Developing Countries' Capital Drain, with Hamid Rashid, Project Syndicate, February 18, 2016. What's Holding Back the World Economy?, with Hamid Rashid, Project Syndicate, February 8, 2016. China's Bumpy New Normal, Project Syndicate, January 27, 2016, and in Columbia Business School Chazen Global Insights, February 1, 2016. Argentina's Uncertain Prospects, with Martin Guzman, Project Syndicate, January 29, 2016. Sri Lanka's Rebirth, Project Syndicate, January 25, 2016. Article for New York Magazine's Beginnings: The Breakthrough Moment, January 12, 2016. The New Geo-Economics, Project Syndicate, January 8, 2016. How to Fix Inequality, Boston Globe, December 10, 2015. When Inequality Kills, Project Syndicate, November 9, 2015. A Step Forward for Sovereign Debt, with Martin Guzman, Project Syndicate, November 9, 2015. Tax avoidance Fuels Global Inequality, CNN, October 9, 2015. El Gobierno Debe Exigir un Acuerdo Transpacifico que Beneficie a los Mexicanos, with Adam S. Hersh, La Jornada, October 3, 2015. The Trans-Pacific Free-Trade Charade, with Adam S. Hersh, Project Syndicate, October 2, 2015. Don't Let TPP Jeopardise Malaysia's Future, with Adam S. Hersh, The Malaysian Insider, October 2, 2015. Nobel de Economia a Humala: No Permitan que el TPP Encierre al Peru en Relaciones Comerciales Desiguales, with Adam S. Hersh, La Republica, October 1, 2015. Fed Up with the Fed, Project Syndicate, September 7, 2015. Joseph Stiglitz Explains Why the Fed Shouldn't Raise Interest Rates, Los Angeles Times, August 27, 2015. What the United States Owes Puerto Rico, with Mark Medish, The Wall Street Journal, August 13, 2015. America in the Way, Project Syndicate, August 6, 2015. Greece, the Sacrificial Lamb, The New York Times, July 25, 2015. Joseph E. Stiglitz: The U.S. Must Save Greece, Time.com, July 9, 2015. Europe Must Back Away from Greek Austerity Cliff: Joseph Stiglitz, USA Today, July 7, 2015. Argentina Shows Greece There May Be Life After Default, with Martin Guzman, Huffington Post, June 30, 2015. Europe's Attack on Greek Democracy, Project Syndicate, June 29, 2015. A Rule of Law for Sovereign Debt, with Martin Guzman, Project Syndicate, June 15, 2015. Europe's Last Act?, Project Syndicate, June 5, 2015. Where Progressives and Conservatives Agree on Trade: Current Investor-Trade Dispute Settlement Model is Bad for the United States, Letter to Congress, Roosevelt Institute, May 18, 2015. Inequality, Wealth, and Capital, FEPS Queries Magazine, Summer 2015. The Secret Corporate Takeover, Project Syndicate, May 13, 2015. Asia's Multilateralism, op-ed on the AIIB, Project Syndicate April 13, 2015. A Fair Hearing for Sovereign Debt, with Martin Guzman, Project Syndicate, March 5, 2015. Obama Versus Obamacare, with Dean Baker and Arjun Jayadev, Project Syndicate, February 10, 2015. A Greek Morality Tale, Project Syndicate, February 3, 2015. Don't Trade Away Our Health, The New York Times, January 31, 2015. Europe Will Benefit from Greece Being Given a Fresh Start, letter to the Financial Times, signed with several other scholars, January 22, 2015. The Politics of Economic Stupidity, Project Syndicate, January 20, 2015. Europe's Lapse of Reason, Project Syndicate, January 8, 2015. The Chinese Century, Vanity Fair, January 2015. Inequality and the American Child, Project Syndicate, December 11, 2014. Slow Growth and Inequality Are Political Choices. We Can Choose Otherwise. Washington Monthly, December 2014. Fed Can Influence Banks to Spread Opportunity, The New York Times, October 28, 2014. The Age of Vulnerability, Project Syndicate, October 13, 2014. The World Needs a Sovereign Debt Restructuring Mechanism, Emerging Markets, October 12, 2014. Debeaking the Vultures, Project Syndicate, October 1, 2014. Europe's Austerity Zombies, Project Syndicate, September 26, 2014. Comments on wage growth, The Financial Times, September 18, 2014. Comments on Scotland, The Sunday Herald, September 14, 2014. Democracy in the Twenty-First Century, Project Syndicate, September 1, 2014. The Economy Should Serve Society, Finance and Development, September 2014. Phony Capitalism, Harper's Magazine, September 2014. Argentina's Griesafault, with Martin Guzman, Project Syndicate, August 7, 2014. A New U.S. Strategy for Business in Africa, The Financial Times, August 4, 2014. A Global System Is Needed for Debt Restructuring, The New York Times, Room for Debate forum on Argentina's default, August 1, 2014. American Delusions Down Under, Project Syndicate, July 9, 2014. The Myth of America's Golden Age, Politico, July/August 2014. Inequality Is Not Inevitable, The New York Times, June 27, 2014. Saving a Broken Euro, Queries, June 23, 2014. Creating a Learning Society, Project Syndicate, June 3, 2014. A Light Unto Cities (lessons from Medellin), Project Syndicate, May 7, 2014. Reforming China's State-Market Balance, Project Syndicate, April 2, 2014. Eliminating Extreme Inequality: A Sustainable Development Goal, 2015-2030, with Michael Doyle, Ethics and International Affairs, March 20, 2014. On the Wrong Side of Globalization, The New York Times, March 17, 2014. The Innovation Enigma, Project Syndicate, March 9, 2014. Stagnation by Design, Project Syndicate, February 6, 2014. Advanced Malaise, Project Syndicate, January 13, 2014. The Great Malaise Drags On, Project Syndicate, January 5, 2014. Joint Liability in International Lending: A Proposal for Amending the Treaty of Lisbon, with Kaushik Basu, VOX, January 2, 2014. In No One We Trust, The New York Times, December 21, 2013. An Agenda to Save the Euro, Project Syndicate, December 4, 2013. The Insanity of Our Food Policy, The New York Times, November 16, 2013. Inequality Is a Choice, The New York Times, October 13, 2013. The Global Financial Crisis Has Made Capital Account Management More Important than Ever, Emerging Markets, October 11, 2013. Five Years in Limbo, Project Syndicate, October 8, 2013. How Washington Caved to Wall Street, TIME, September 23, 2013. There Is Still Much to Learn from Lehman, The Financial Times, September 18, 2013. Why Janet Yellen, Not Larry Summers, Should Lead the Fed, The New York Times, September 6, 2013. The Vultures' Victory, Project Syndicate, September 4, 2013. Australia, You Don't Know How Good You've Got It, The Sydney Morning Herald, September 2, 2013. How Dr. King Shaped My Work in Economics, The New York Times, August 28, 2013. The Wrong Lesson From Detroit's Bankruptcy, The New York Times, August 12, 2013. The Changing of the Monetary Guard, Project Syndicate, August 5, 2013. How Intellectual Property Reinforces Inequality, The New York Times, July 14, 2013. The Free-Trade Charade, Project Syndicate, July 4, 2013. Sub-Saharan Africa's Subprime Borrowers, with Hamid Rashid, Project Syndicate, June 25, 2013. Japan Is a Model, Not a Cautionary Tale, The New York Times, June 9, 2013. East Asia's Lessons for Africa, Project Syndicate, June 3, 2013. Globalisation Isn't Just About Profits. It's About Taxes, Too, The Guardian, May 27, 2013. Student Debt and the Crushing of the American Dream, The New York Times, May 12, 2013. Lives versus Profits, Project Syndicate, May 6, 2013. The Lessons of the North Atlantic Crisis for Economic Theory and Policy, IMF Direct, May 3, 2013. A New World's New Development Bank, with Nicholas Stern, Amar Bhattacharya, Mattia Romani, Project Syndicate, May 1, 2013. A Tax System Stacked Against the 99 Percent, The New York Times, April 15, 2013. India's Patently Wise Decision, with Arjun Jayadev, Project Syndicate, April 8, 2013. The Promise of Abenomics, Project Syndicate, April 5, 2013. Singapore's Lessons for an Unequal America, The New York Times, March 18, 2013. What Is Italy Saying? Project Syndicate, March 4, 2013. Equality of Opportunity, Our National Myth, The New York Times, February 16, 2013. Complacency in a Leaderless World, Project Syndicate, February 6, 2013. No US Peace Dividend After Afghanistan, with Linda Bilmes, Financial Times, January 23, 2013. Inequality Is Holding Back the Recovery, The New York Times, January 19, 2013. The Post-Crisis Crises, Project Syndicate, January 7, 2013. Joseph Stiglitz: US Setting "Terrible Example" with Income Inequality, The Global Post, December 27, 2012. Some Are More Unequal Than Others, The New York Times, October 26, 2012. Political Causes, Political Solutions for Inequality, The New York Times, October 18, 2012. Fallacies of Romney's Logic, USA Today, September 19, 2012. The One Housing Solution Left: Mass Mortgage Refinancing, with Mark Zandi, The New York Times, August 12, 2012. Debt buries american dream, USA Today, July 5, 2012. America is no longer a land of opportunity, Financial Times, June 26, 2012. To grow again, attack inequality, New York Daily News, June 24, 2012. How policy has contributed to the great economic divide, The Washington Post, June 22, 2012. An Economic Agenda for the G20, Emerging Markets, June 14, 2012. The 1 Percent's Problem, Vanity Fair, May, 2012. The 99 percent wakes up, The Daily Beast, May 2, 2012. End the monopoly: Let's make it a real World Bank at last, Financial Times, March 18, 2012. The US labour market is still a shambles, Financial Times, March 12, 2012. The Book of Jobs, Vanity Fair, January 2012. Read the related academic paper, Sectoral Dislocations and Long Run Cycles, with Domenico Delli Gatti, Mauro Gallegati, Bruce C. Greenwald and Alberto Russo, forthcoming in the Proceedings of the International Economic Association's 2011 Meetings. Achieving the Impossible, Emerging Markets, September 22, 2011. America's Costly War Machine, with Linda Bilmes, Los Angeles Times, September 18, 2011. How to put America back to work, Politico, September 7, 2011. How to make the best of the long malaise, Financial Times, August 9, 2011. Europe finally admits its debt problem to save the euro, Financial Times, July 22, 2010. Eurozone's problems are political, not economic, Financial Times, July 20, 2011. Europe's travails and our collective fate, The New York Times and International Herald Tribune, July 19, 2011. Response to PBS story on Fannie Mae, PBS NewsHour Web site, July 1, 2011. We must help Tunisia to nurture democracy, Financial Times, May 25, 2011. The IMF cannot afford to make a mistake with Strauss-Kahn's successor, The Telegraph, May 21, 2011. ECB-IMF deal is a noose that will strangle economic recovery, with Michael Cragg, Irish Times, April 9, 2011. Of the 1%, by the 1%, for the 1%, Vanity Fair, May 2011. The best alternative to a new global currency, Financial Times, March 31, 2011. Why I didn't sign deficit letter, Politico, March 28, 2011. A balanced debate about reforming economics, IMF blog, March 22,2011. Turbulence ahead: another year of malaise along the Atlantic, Newsweek, January 23, 2011. Economics: Facing a Marked Global Reversal, Financial Times, January 3, 2011. The Economic Outrage of 2010, New York Daily News, December 22, 2010. Federal Spending Is a Necessity, Los Angeles Times, November 14, 2010. A Currency War Has No Winners, The Guardian, November 1, 2010. Why Easier Money Won't Work, The Wall Street Journal, October 23, 2010. To Choose Austerity Is to Bet It All on the Confidence Fairy, Guardian, October 19, 2010. It Is Folly to Place All Our Trust in the Fed, Financial Times, October 18, 2010. Time to Build a Better Stimulus, Politico, September 15, 2010. The True Cost of the Iraq War: $3 Trillion and Beyond, with Linda J. Bilmes, The Washington Post, September 5, 2010. Needed: a New Economic Paradigm, Financial Times, August 19, 2010. Taming Finance in an Age of Austerity, Project Syndicate, July 8, 2010. Fiscal Conservatism May Be Good for One Nation, but Threatens Collective Disaster, The Independent, June 15, 2010. Reach Equals Grasp on Banking Bill, Politico, June 7, 2010. Financial Re-Regulation and Democracy, Project Syndicate, June 4, 2010. Protect Taxpayers from Wall Street Risk, CNN.com, May 3, 2010. Can the Euro Be Saved? Project Syndicate, May 2010. The Non-Existent Hand, London Review of Books, April 22, 2010. The Case Against Gene Patents, with John Sulston, Wall Street Journal, April 16, 2010. Build Strong Rules for Finance System, Politico, April 12, 2010. No Time for a Trade War, Project Syndicate, April 6, 2010. The Dangers of Deficit Reduction, Project Syndicate, March 5, 2010. Obama Must Resist "Deficit Fetish" Politico.com, February 10, 2010. Watchdogs Need Not Bark Together, Financial Times, February 10, 2010. Obama's Banking Proposals are a Good First Step, LA Times, January 29, 2010. Obama's Falling Down on the Job, New York Daily News, January 29, 2010. A Principled Europe Would Not Leave Greece to Bleed, The Guardian (UK), January 25, 2010. "Incentives and the Performance of America's Financial Sector," testimony at the Hearing on Compensation in the Financial Industry, House Committee on Financial Services, January 22, 2010. Overcoming the Copenhagen Failure, Project Syndicate, January 2010. The Imperative for Improved Global Economic Coordination, Development Outreach, December 2009. Too Big to Live, Project Syndicate, December 2009. Let a Hundred Theories Bloom, Project Syndicate, November 2009. Death Cometh for the Greenback, The National Interest, October 27, 2009. For all of Obama's Talk of Overhaul, the US has Failed to Wind in Wall Street, The Guardian (UK), September 14, 2009. GDP Seen as Inadequate Measure of Economic Health, by David Jolly, New York Times, September 14, 2009. Towards A Better Measure of Well-Being,Financial Times, September 13, 2009. Thanks to the Deficit, the Buck Stops Here, Washington Post, August 30, 2009. Stimulate or Die, Project Syndicate, August 2009. The US in Iraq: An Economics Lesson, LA Times, July 2, 2009. The UN Takes Charge, Project Syndicate, July 2009. Wall Street's Toxic Message, Vanity Fair, July 2009. One Small Step Forward, The Guardian (UK), June 28, 2009. A Global Recovery for a Global Recession, The Nation, June 24, 2009. America's Socialism for the Rich, Project Syndicate, June 2009. The Spring of the Zombies, Project Syndicate, May 2009. Developing Countries and the Global Crisis, Project Syndicate, April 2009. Obama's Ersatz Capitalism, The New YorkTimes, April 1, 2009. Reform is Needed. Reform is in the Air. We Can't Afford to Fail, The Guardian (UK), March 27, 2009. A Bank Bailout That Works, The Nation, March 23, 2009. How to Fail to Recover, Project Syndicate, March 2009. Obama's Chance to Lead the Green Recovery, with Nicholas Stern, Financial Times, March 4, 2009. Davos Man's Depression, Project Syndicate, February 2009. Give us Bangs for our Bailout Bucks, The Times (London), January 27, 2009. How to Rescue the Bank Bailout, CNN.com, January 26, 2009. Do Not Squander America's Stimulus on Tax Cuts, Financial Times, January 15, 2009. Recommendations for Immediate Action, a statement from the first meeting of the Comission of Experts, January 4-6, 2009, New York. The Rocky Road to Recovery, Project Syndicate, January 2009. The $10 Trillion Hangover: Paying the Price for Eight Years of Bush, Harper's Magazine, January 2009. Markets Can't Rule Themselves, Newsweek, December 31, 2008. Chapter 11 is the Right Road for America's Carmakers, The Financial Times, December 12, 2008. Getting Bang for Your Buck, The Guardian (UK), December 5, 2008. The Triumphant Return of John Maynard Keynes, Project Syndicate, December 2008. It Doesn't Take Nostradamus, Economists' Voice, November 2008. A $1 Trillion Answer, New York Times, November 29, 2008. Dealing with the Global Crisis, Q&A for the International Herald Tribune, November 18, 2008. Global Crisis, Made in America, Der Spiegel, November 12, 2008. The Next Bretton Woods, Project Syndicate, November 2008. Financial Crisis: Europe's Leaders Can Seize This Opportunity to Fill the Leadership Gap, The Daily Telegraph (UK), November 11, 2008. More Pain to Come, Even if He's Perfect, Washington Post, November 9, 2008. Let's Throw Away the Rule Book, The Guardian (UK), November 6, 2008. The Seven Deadly Deficits, Mother Jones Magazine, November/December 2008. Realign the Interests of Wall Street,Harpers Magazine, November 2008. Dear Mr. President: Advice from Seven Nobel Laureates on Fixing the Economy, Newsweek, October 22, 2008. A Crisis of Confidence, The Guardian (UK), October 22, 2008. Testimony on "The Future of Financial Services Regulation," House Financial Services Committee, October 21, 2008. Economist.com Online Debate: Con side of "It would be a mistake to regulate the financial system heavily after the crisis," Economist online, October 17, 2008. How to Get Out of the Financial Crisis, Time Magazine, October 17, 2008. Guided by an Invisible Hand, New Statesman (UK), October 16, 2008. Paulson Tries Again, The Guardian, October 16, 2008. The Dismal Questions, The New York Times, October 7, 2008. We Aren't Done Yet: Comments on the Financial Crises and Bailout, The Economists' View, October 2008. Reversal of Fortune, Vanity Fair, November 2008 issue. Good Day for Democracy, The Guardian (UK), October 1, 2008. A Chance to Improve the Bail-out, USA Today, September 30, 2008. Bail-out Blues, The Guardian (UK), September 30, 2008. Dr. Joseph Stiglitz, Interview with Ron Garmon about the Financial Crisis and the Iraq war, LA City Beat, September 24, 2008. A Better Bail-out, The Nation.com, September 26, 2008. Commentary: How to Prevent the Next Wall Street Crisis, CNN.com, September 17, 2008. Stiglitz: The Fall of Wall Street is to Market Fundamentalism What the Fall of the Berlin Wall Was to Communism, interview with Nathan Gardels, The Huffington Post, September 16, 2008. The Fruit of Hypocrisy, in The Guardian (UK), September 16, 2008. Transcript of Interview on the Turmoil on Wall Street, Lou Dobbs Tonight, September 15, 2008. Little Risk of Great Depression Repeat, AFP News, September 15, 2008. Falling Down: No manufacturing. No new ideas. What's our economy based on? in The New Republic, September 10, 2008 issue. Kevin Conrad - Heroes of the Environment 2008, Time Magazine, September 2008. Learning the Lessons of Iraq, Project Syndicate, September 2008. Turn Left for Growth Project Syndicate, August 2008. Is this any way to rebuild Iraq? by Joseph Stiglitz and Linda Bilmes, The Los Angeles Times, August 15, 2008. Stiglitz on Central Banks and Inflation, Interview on Europe this Week, June 31, 2008. Fannie and Freddie Must Not Get a Free Lunch, The Financial Times, July 25, 2008. Science is Being Held Back by Outdated Laws, Letter with John Sulston, The Times (London), July 5, 2008. The End of Neo-Liberalism? Project Syndicate, July 2008. Joseph Stiglitz talks to the Sunday Times, Sunday Times (UK), June 15, 2008. Scarcity in an Age of Plenty, The Guardian UK, June 15, 2008. Joseph Stiglitz on Recession, interview with James Harris, TruthDig, June 3, 2008. Stagflation Redux, Inc. Magazine, June 2008. Scarcity in an Age of Plenty, Project Syndicate, June 2008. Fair Trade: The Fair Play Debate, The National Interest, Number 95, May/June 2008. The Failure of Inflation Targeting, Project Syndicate, May 2008. Deficit, Schmeficit, Conde Nast Portfolio, May 2008 Issue. Ask a Question: The Three Trillion Dollar War, readers' questions answered by Joseph Stiglitz and Linda Bilmes, McClatchy Newspapers, April 12, 2008. America's War-Torn Economy, Project Syndicate, April 2008. $3 Trillion May Be Too Low, by Joseph Stiglitz and Linda Bilmes, Comment is Free, The Guardian (UK), April 6, 2008. A Deficit of Leadership, Comment is Free, The Guardian (UK), April 8, 2008. Stiglitz on US Economy, interview with Anna Martin, CNBC, April 2, 2008. "The $3 Trillion War," an excerpt from the book, The Three Trillion Dollar War by Stiglitz and Linda Bilmes, in Vanity Fair, April 2008 issue. The Three Trillion Dollar War, Project Syndicate, March 2008. Ways We Can Fix This Giant Mess, Newsweek, March 31, 2008. Are We in the Worst Financial Crisis and Can We Solve it? You Ask the Questions... the Independent (UK), March 24, 2008. Economist Stiglitz Blames Crunch on "Flawed" City Bonuses System, by Sean O'Grady, the Independent (UK), March 24, 2008. There is no Such Thing as a War for Free, by Joseph Stiglitz and Linda Bilmes, Chicago Tribune, March 20, 2008. Stiglitz: U.S. Fiscal Measures Too Little Too Late, by Brian Fallow, New Zealand Herald, March 19, 2008. The High Cost of Fighting a Losing Battle, by Joseph Stiglitz and Linda Bilmes, The Financial Times, March 18, 2008. War's price tag, by Joseph Stiglitz and Linda Bilmes, Los Angeles Times, Sunday, March 16, 2008. The Iraq War Will Cost Us $3 Trillion, and Much More, by Joseph Stiglitz and Linda Bilmes, The Washington Post, Sunday, March 9, 2008. Iraq War Caused Slowdown in the US, by Peter Wilson, The Australian, February 28, 2008. "War at Any Cost? The Total Economic Costs of the War Beyond the Federal Budget," written testimony for the Joint Economic Committee, February 28, 2008. The Three Trillion Dollar War, with Linda Bilmes, The Sunday Times (London), February 23, 2008. Alpine Schadenfreude, Project Syndicate, February 2008. How to Stop the Downturn, The New York Times, January 23, 2008. Day of Reckoning in the US Glasshouse, The Times (London), January 21, 2008. Stagflation Cometh, The Guardian (UK), January 2, 2008. Showdown in Bali, Project Syndicate, December 2007. The Economic Consequences of Mr. Bush, Vanity Fair magazine, December 2007. Financial Hypocrisy, Project Syndicate, November 2007. America's Houses of Cards, Project Syndicate, October 2007. Q&A with Joseph Stiglitz on economic and climate change, International Herald Tribune, September 26, 2007. The Malaysian Miracle, Project Syndicate, September 2007. Bleakonomics: Review of The Shock Doctrine: The Rise of Disaster Capitalism, by Naomi Klein, New York Times Sunday Book Review, September 30, 2007. America's Day of Reckoning, Project Syndicate, August 2007. The Asian Crisis Ten Years After, Project Syndicate, July 2007. Questions for Robert Zoellick, Project Syndicate, June 2007. Good Governance Begins at Home, Project Syndicate, May 2007. "The World Bank and Development Assistance Testimony," presentation before the House Financial Services Committee May 22, 2007. The Wolfowitz Affair and its Consequences, The Financial Times, May 6, 2007. Getting Beyond Balanced Budget Mania and Addressing the Nation's Needs, Transcript of event at "Beyond Balanced Budget Mania," Economic Policy Institute, April 12, 2007. China's New Economic Model, Project Syndicate, April 2007. Prizes, Not Patents, Project Syndicate, March 2007. The EUs Global Mission, Project Syndicate, March 2007. MBA Podcast: Making Globalisation Work, Times Online, February 18, 2007. 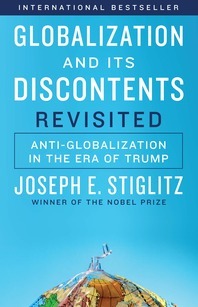 Managing Globalization, Q&A with Joseph Stiglitz, International Herald Tribune, February 14, 2007. The Most Global Issue, Our Planet, the magazine of the United Nations Environment Programme, February 2007. Will the Dam Break in 2007? Project Syndicate, January 2007. The Phelps Factor, Project Syndicate, December 2006. John Kenneth Galbraith Understood Capitalism as Lived - not as Theorized, The Christian Science Monitor, December 28, 2006. A Cool Calculus of Global Warming, Project Syndicate, November 2006. Taking control of Globalization, The Seattle Post-Intelligencer, October 13, 2006. Can the World Economy Be saved?, The Toronto Globe and Mail, October 12, 2006. Managing Globalization, Q&A with Joseph Stiglitz, The International Herald Tribune, October 11, 2006. How to Fix the Global Economy, The New York Times, October 3, 2006. Good Numbers Gone Bad, Fortune Magazine, October 2, 2006. The Tyranny of King Cotton, Project Syndicate, October 2006. Corrupting the Fight Against Corruption, Project Syndicate, October 2006. How Globalization Could Help Ease Global Warming, The San Francisco Chronicle, September 17, 2006. Give Prizes not Patents,The New Scientist, September 16, 2006. We Have Become Rich Countries of Poor People, The Financial Times, September 8, 2006. Making Globalization Work, Project Syndicate, September 2006. The Real Reason You're Held up at the Airport, The London Evening Standard, August 25, 2006. An Airport Debacle Worsened by Greed and Neglect, The Financial Times, August 22, 2006. The Demise of the Development Round, Project Syndicate, August 2006. America's New Trade Hypocrisy, with Hamid Rashid, Project Syndicate, July 2006.
Who Owns Bolivia? Project Syndicate, June 2006. The IMF's America Problem, Project Syndicate, May 2006. A Progressive Response to Globalization, in The Nation, "Taming Global Capitalism Anew" forum, April 17, 2006 issue. Development in Defiance of the Washington Consensus, The Guardian, April 13, 2006. China's Roadmap Project Syndicate, April 2006. The High Cost of the Iraq War, The Economists' Voice, Vol.3, Issue 5, March 2006. Bush's Bad-Faith Energy Policy, Project Syndicate, March 2006. It Takes More than Free Trade to End Poverty, The Independent, February 3, 2006. A Tale of Two Deficits, Global Agenda, The Magazine of the World Economic Forum Annual Meeting, 2006, pp. 85-86. No Old-Age Security in the Private Sector Either, Los Angeles Times, May 22, 2005. Global Playing Field: More Level, but It Still Has Bumps, Review of Thomas Friedman's book The World is Flat, The New York Times, April 30, 2005. Securing Social Security for the Future, The Economists' Voice, Special Issue on Social Security, Volume 2, Issue 1, 2005. "Markets and Morals," in The Atlantic Monthly, April 2006, pp. 44. The Social Costs of Globalization, Financial Times, February 25, 2004. That Was Then, The American Prospect, Febuary 2004. The Parties' Flip-Flops on Deficit Spending: Economics or Politics?, The Economists' Voice, Volume 1, Issue 1, 2004. Odious Rulers, Odious Debts, The Atlantic Monthly, September 10, 2003. Bush's Tax Plan - The Dangers, The New York Review of Books, March 13, 2003. Fair Play? Not Always In Fair-Trade Treaties, The Nation, February 18, 2003. Economists' Statement Opposing the Bush Tax Cuts, Economic Policy Institute, February 2003. "My Book and Its Discontents," in Aspenia International: Is the West Still the West, 9(19-20), 2003, pp.9-25. Also in Italian under "Tutti gli Errori del Fondo Monetario Internazionale," in Aspenia: Il Prezo dell'Impero, 9(20), 2003, pp. 10-28. Globalism's Discontents, The American Prospect, January 14, 2002.